From hypoxia and strange creatures washing up on beaches, to jellyfish blooms, research collaborations with fishermen, and advancements in underwater video research tools – Oregon’s marine reserves were teeming with discoveries this year. Here we take a look back at a few of our top videos and stories from 2017. 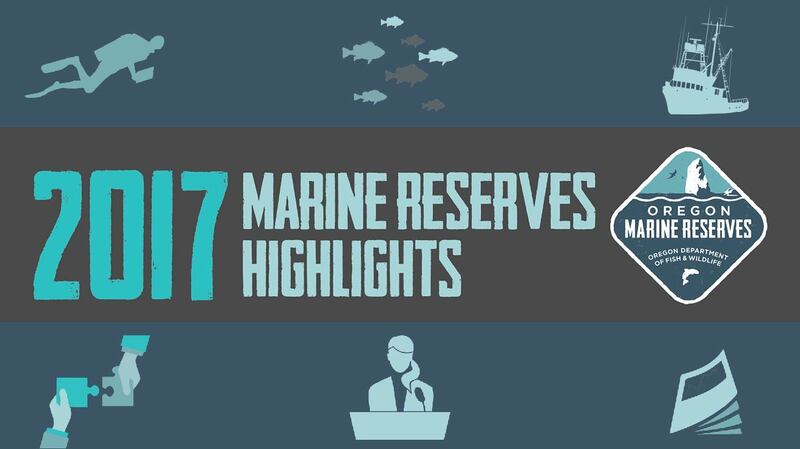 You’ll also find our annual Marine Reserves Program highlights video and infographic. 1. Hypoxia – Towards the end of July, Oregon State University’s oceanographic buoy located in Cape Perpetua Marine Reserve showed a drop in ocean oxygen levels. This hypoxic (low oxygen) event ran from roughly mid-summer into the fall. Read more about what researchers found – including a video of what they saw while doing crab research. 2. Pyrosomes – In past years pyrosomes were rare finds on Oregon beaches. But in the winter of 2016 – 2017 they became as common as kelp in driftlines and in the spring they washed up in astounding numbers, awing beachcombers and spurring scientists to study why these creatures were appearing in unprecedented swarms. Read more about these strange creatures that are still washing up on Oregon’s beaches. And, here’s a video showing what biologists were seeing offshore and at the docks. 3. Fish and Invertebrate Spotlights – Many interesting species live beneath the ocean surface in our nearshore waters – from tiger rockfish, to cabezon nicknamed ‘mother-in-law’ fish (due to it’s large mouth and constant croaking). And, don’t forget the invertebrates. Here’s an interesting story on sea anemones, that look more analogous to flowering plants than the predatory animals that they actually are, along with information about our sea star surveys. 4. 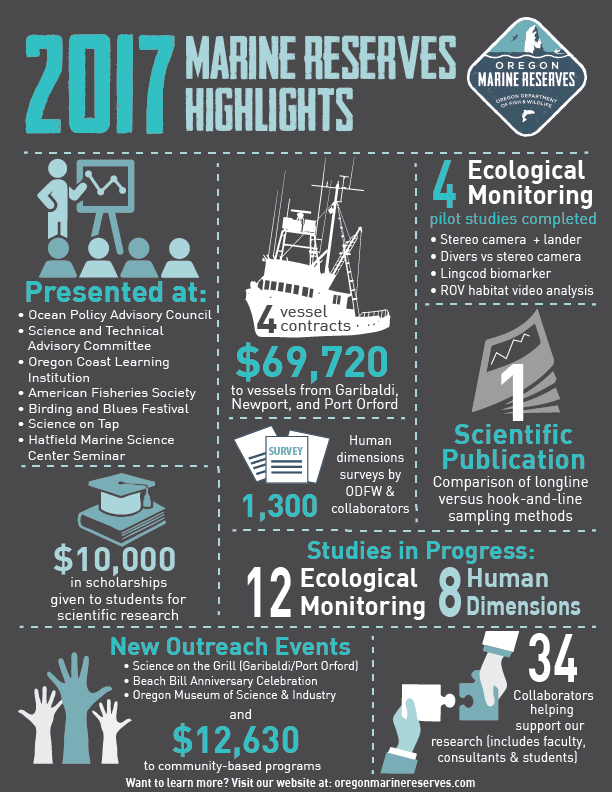 Policy and Management Highlights – On the policy front, the ODFW Marine Reserves Program underwent a 5 year review with the Science and Technical Advisory Committee; the technical arm of the Ocean Policy Advisory Council. We also took a deeper dive into the site management of Cascade Head with finalization of the Cascade Head Marine Reserve Site Management Plan. 5. Jellyfish Bloom – Besides pyrosomes and hypoxia, another oceanic oddity this year was a jellyfish bloom. Sea nettles are a type of jellyfish that tend to be more abundant when ocean productivity is high. Thanks to this year’s big upwelling there’s been lots of food in the water for them to eat. The lower sea nettle numbers last year were likely a byproduct of the warm water ‘Blob’ that resulted in less productivity off our coast. Click here for a video to see what researchers saw just south of Cascade Head Marine Reserve.